What are the symptoms of an Achilles rupture ? The history of Achilles rupture is usually classically described as a feeling of being kicked to the Achilles area and sometimes even a very audible “crack” or “snap” is heard. There is an immediate inability to continue with the activity and well localised pain. In the vast majority of cases bruising behind and to the sides of the ankle and swelling occurs rapidly. Sometimes it can be less classical, especially in older patients or those with poor soft tissue quality (such as patients on long term steroids). The injury may even be recalled as a sprain of the ankle . Usually two weeks after a complete rupture there is usually very little pain anymore. At this stage it’s more common to notice a weakness of gait, possibly a feeling of instability and also a limp.It will also not be possible to raise yourself onto tip toes on the injured ankle on its own (known as a single heel-rise test). The mainstay of diagnosing an Achilles tendon rupture is by clinical examination, not necessarily scanning. It sometimes can be a difficult diagnosis to make especially if there is a lot of pain or swelling associated. The most sensitive test for an Achilles tendon rupture is to squeeze the injured calf with the patient prone, ankle hanging off the end of the examination couch , and look for ankle plantar-flexion (downward directed movement). If there is no plantar flexion on compressing the calf then this is highly likely to indicate the presence of a significant injury to the Achilles tendon. If a person can stand and weight-bear the ability to do a single heel rise can be assessed. This is a more relevant test to do after the acute situation has passed and a patient is presenting late. Such a case is shown in the photograph above with a chronic presenting right Achilles rupture where the patient is unable to perform a single heel rise. The test can sometimes be difficult to perform due to significant calf swelling and pain which would warrant urgent imaging of the Achilles tendon. The advent of commonly available good quality ultrasound (and radiologists skilled in the technique) has revolutionised the management of Achilles tendon injuries. The investigation is highly sensitive for detecting ruptures, takes only minutes and logistically is far easier to organise often than an MRI scan. An additional and important advantage is that the dynamic nature of the investigation (allowing the radiologist to move the ankle and Achilles tendon actively during the investigation) enables a clear decision to be made on how well the tendon ends come together. If the tendon ends come well together with the foot fully pointed (plantar-flexed) then serious consideration can be given to non-operative management in the acute rupture. An additional advantage of the ultrasound is that the calf veins can also be scanned for DVT , which can co-exist with an Achilles rupture. An MRI scan is also an appropriate investigation for diagnosing the injury but it is not possible to speculate often how opposable ruptured tendons may be if they have separated. Conservative management of Achilles tendon rupture. The key point to remember is that the Achilles tendon actually repairs itself, no matter whether it is being operated upon or treated conservatively. It is critical of course that the Achilles rupture is identified and then that the ends are held opposed closely to each other at the appropriate length until the Achilles tendon has been able to heal. . Poor function is likely to result is the Achilles is allowed to heal in an elongated position, rather like lengthening a bow-string. With ultrasound imaging confirming correct position of the Achilles rupture this is far less likely to occur. Whether the Achilles tendon is operated on or treated conservatively with cast immobilisation the time required to allow weight-bearing and starting of mobilisation is in the region of five to six weeks. If non-operative treatment is adopted then a cast will be required for 5-6 weeks and the position off the ankle altered progressively to bring the foot up from full plantar-flexion (pointed toe position ) to neutral (the foot sitting at a right angle to the tibia). After this weight bearing can be started using a long post-operative boot. Physiotherapy is useful to work on strength and balance once a patient is full weight-bearing. Over-stretching the Achilles by pushing dorsi-flexion activities in these early days should be avoided. It is a commonly held belief that younger and more active patients should be advised for operative repair. However with the advent of detailed ultrasound scanning allowing clear identification of how well tendons come together this argument is more difficult to make on an individual case basis. If the achilles tendon ends do not come together (as demonstrated on ultrasound) then repair should be undertaken in most cases. It is however likely that the risk of re-rupture of the tendon is reduced by operative repair though this has not been unequivocally reflected in the published literature and operation gives a relatively small advantage in percentage terms. In the patient with delayed presentation or initially missed diagnosis of Achilles rupture operation is usually advised , even if the tendon ends come well together. There is good evidence that direct repair of the Achilles can be carried out for up to six weeks after the rupture with little adverse effect on the outcome. The only thing that delay of this order of magnitude means is that the opportunity for conservative treatment is lost. 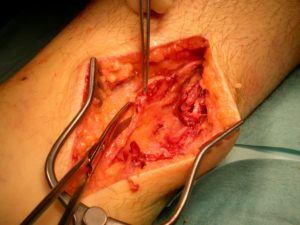 The operation to repair Achilles tendon is a relatively small operation in itself with occasional procedure specific complications of wound infection, wound breakdown or delayed wound healing and scar adhesion or sensitivity. Beyond this timeframe the tendon ends can become retracted and effectively shortened and the tendon tissue to be repaired is probably less prone to heal. A very good salvage procedure for such later presentations (even up to several years post rupture) is to transfer the flexor hallucis longus tendon (which is anatomically immediately adjacent to the Achilles) and weave it between the Achilles tendon ends, producing a composite tendon. The functional outcome of such tendon transfer procedures is also likely to be excellent, more dependent on patient age and pre-injury function (and achieving the correct tendon tension) than anything else. The period of time immobilised post procedure is the same as for a primary Achilles repair and the rehabilitation largely the same. Over the last few years it has become increasingly recognised that Achilles rupture is an independent and additional risk factor for development of DVT. Following a rupture, whether operated on or not, patients are placed into a below knee cast and this also is an accepted risk factor for deep vein thrombosis. There is little or no downside in placing patients with a suspected or confirmed diagnosis of Achilles rupture on some low molecular weight heparin for much of their period in plaster cast. Any calf pain or increase in swelling that occurs following the injury ,whether on an anticoagulant or not , should be investigated immediately. After five to six weeks of cast immobilisation patients may generally start weight-bearing with the use of a long Aircast boot or similar post-operative boot. Generally the progression to full weight-bearing is determined by comfort and can normally be achieved by eight or possibly nine weeks post injury. From the time that the patient goes into the Aircast boot physiotherapy can be commenced and should be based around a strengthening and balance regime rather than pushing range of movement. At this early initial stage following the Achilles rupture too actively pursuing full dorsiflexion of the ankle in particular does risk stretching the repaired Achilles and leading to over-lengthening of the tendon and potentially reducing its propulsive power. 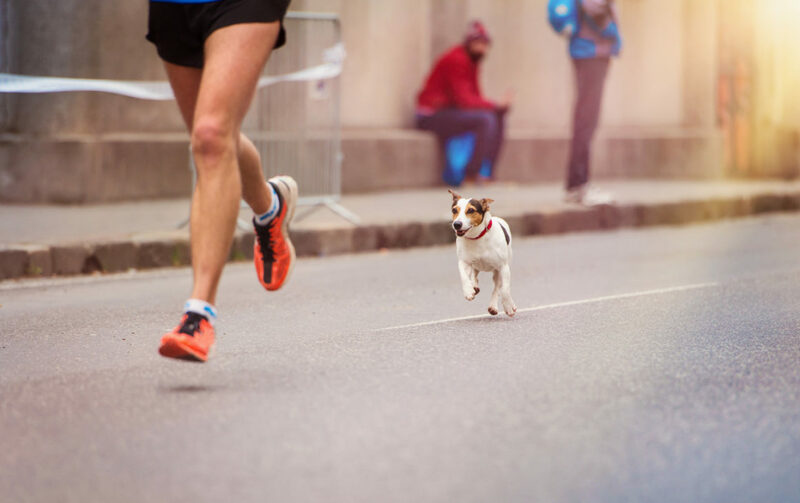 It can be expected that light jogging in a younger more active patient can be returned to soonest at ten weeks post injury. More useful running ,enough to allow return to sports will likely be somewhere after 4 months . Mr Herron was recommended by a physiotherapist I visited post an injury which I believed to be a torn muscle. I had unknowingly walked around on a ruptured Achilles for 2 months with swelling and a limp. During my first consultation Mr Herron informed me I required an operation. I was shocked, upset and fearful at the prospect of undergoing surgery as my father passed away under general anaesthetic. In the space of 40 minutes Mr Herron elevated any concerns, made me feel confident my injury was recoverable and enabled me to visualise the benefits of undergoing surgery. 9 months after an excellent procedure and a level of post op support which cannot be measured I am fully recovered and enjoying progressing with exercise and normal life. Mr Herron’s knowledge, professionalism, interpersonal skills, intuitive support and assured approach was simply outstanding. I made an outpatient appointment at the Foot and Ankle Clinic in September 2008. I had suffered an injury from a freak accident a year earlier, where my Achilles tendon had been partially torn. There was a lot of damaged tissue, I was in constant pain and had limited functionality in my foot and ankle.I had been told that there was nothing that could be done and I would simply have to live with it. I visited the Clinic and after recommending an aggressive course in physiotherapy I then had a tendon debridement & FHL tendon transfer.I was warned that there maybe a chance that it may not work, however after 4 months of physio I noticed a real big difference. I’m not in constant pain anymore and my functionality has really improved.I have noticed an improvement in my ankle of about 80%, and as you can imagine my quality of life has improved immensely. I would certainly recommend The Foot and Ankle Clinic to anyone else who is suffering any lower limb problems – especially if they have been told that there is nothing that can be done. “I was treated for an Achilles rupture by Mr Herron in May 2012 and from the speed in which I was able to gain an appointment and subsequent operation, to his immediate post-operative care and subsequent follow-up appointments, the standard of care has been first class. He has a very positive easy going manner which I found perfect, as being a sportsman you immediately think your sporting career is over when your Achilles snaps and his operating regime and timing of when to start physio and what to do has ensured I have returned to semi-professional sport right on schedule. I would thoroughly recommend his services. Thanks. FHL Transfer for old Achilles Rupture I am writing to thank you for the excellent care and attention you showed me, and the confidence you gave me in the procedure to re-construct my Achilles tendon. The operation has been an outstanding success. You will recall that before I consulted the Clinic I had had a negative prognosis but now I am back to a normal and active life thanks to the care from the team at the Priory. I would unhesitatingly commend anyone with a similar problem.